My Mother's Praised Chicken is Nigella's mum's dish. She cooked this for the family when they were young.. It is one dish which Nigella cooks most often than anything else. She calls it praised chicken because it is a cross between poached and braised. I thought this is very touching and it moves me to make this dish to savour Nigella's childhood comfort food. It is basically a very flavourful one pot chicken soup. Good for days when your want something nourishing and light. This soup is not a dish my children would sing praises to me because they dislike soup, especially soup over rice. Hmm...I wonder which home cooked dish my children would shout praises in remembrance of me? I made fresh bouquet garni with parsley, thymes and dry bay leaves, and bind a bundle of parsley stalks for the soup. Pour in enough cold water to cover the chicken, though the very top of it may poke out, then pop in the bouquet garni or your herbs of choice, and the parsley stalks or sprigs. The chicken should be almost completely submerged by now and if not, do add some more cold water, You want it just about covered.Bring to a bubble, clamp on the lid, turn the heat to very low and leave to cook for 11/2 - 2 hours. Leave it to stand with the heat off, but the lid still on, for the remaining 20-30 minutes. Note: My chicken is small about 1kg. I cooked it for 1hr and 15 mins and left pot overnight in the fridge. The next day, I removed the hardened fats before heating. The chicken meat is very tender and falling off the bones. I used black peppercorns. Red peppercorns is quite expensive here $14.50 for 1oz and I couldn't find green peppercorns which is a more suitable substitute. 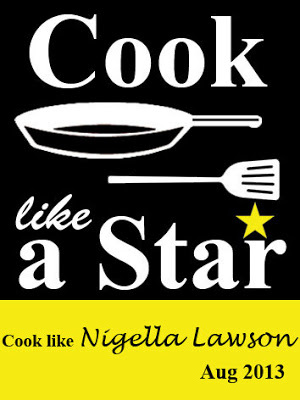 This post is linked to Cook Like A Star 'Nigella Lawson' organised by Anuja from Simple Baking, Zoe from Bake for Happy Kids and Joyce from Kitchen Flavours. This is a lovely bowl of soup. Yes, it is rather touching, what she wrote. The soup must be very fragrant and peppery, just as I love my soups, peppery! Thanks for linking, hope you have a wonderful delicious Sunday! Hi Joyce, actually there is no hint of pepper in this soup. Thanks for making this and giving it a special place in our kitchens too.... bookmarked! Hi Emily, this is good for the family, young and old. Hi Ivy, you will like this healthy soup. Good to make for everyone especially those who are convalescing. Usually I associate the Brits with roast chicken (that's what I always see them eat), but this praised chicken of yours look beautiful. An extra bonus with the flavorful broth. This looks like a wholesome, healthy, family meal ! Perfect for rainy Sundays :). Thank you for linking! This is the kind of chicken soup that "heals" everything... Must be so comforting to enjoy these wonderful flavours. Hi Zoe, yea, good for the mind and soul.